That's a sad state of affairs for all fans of the informative Google Feed that aims to cater to all of your interests. Fortunately, there is a way to bring back the beloved functionality back. The method we have in mind involves the use of the arguably best Android launcher out there, Nova Launcher, which by right should probably be featured on any future Android device out of the box - it's customizable, it's lightweight, and it does its job just right, but we digress. Anyway, here goes. While the stock version of Nova Launcher actually doesn't support the Google Now feed, an official companion addon developed by the app's developer allows you to get it as a leftmost homescreen. And guess what: it's a bit outdated and doesn't come with the redesigned interface in tow and still allows you to swipe and dismiss your stories. Sadly, you no longer get the beautiful looks of the new feed, but at least you get the useful feature back. So, you can download Nova Launcher here and the Google Now companion APK right here. The latter should pop up in the Integrations menu within Nova's settings. Note that Nova Prime is not required, which is nice. Swipe-to-dismiss works as it used to"
Do not miss them, but having the option of getting them back is nifty. Having to click on the 3-dot to dismiss the cards is inconvenient! I removed Google Now after they removed the gesture. Who thought it was a good idea? 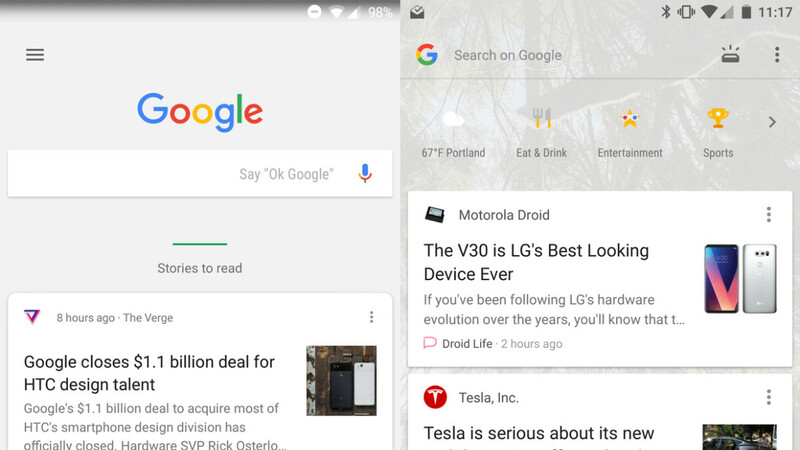 In Nova, under Integrations, you can also configure Google Now to be revealed by swiping in from the edge of any home screen. So, it doesn’t have to just be the leftmost screen. Just tried this and unfortunately it no longer works.